You’ll start this wildlife photography adventure with a flight to Bozeman, Montana, where you’ll be met at the airport and transferred by shuttle to the town of West Yellowstone, a scenic and beautiful three hour drive through the Gallatin Canyon. Note: Please arrive in Bozeman before 1:30pm on this day or arrive one day earlier; we can make hotel arrangements in Bozeman for you if needed. Be on the lookout for bighorn sheep, wolves, and moose which are sometimes seen along this drive. After we check into our hotel, a wine and cheese gathering will follow. Daniel will show some of his work and go over tips and suggestions for shooting in Yellowstone. A group welcome dinner to follow. We’ll spend full days in Yellowstone National Park traveling in guided luxury privately-chartered snow coaches. Each day we’ll travel to different locations in the park including Fire Hole, Fountain Flats, Norris Geyser, Old Faithful, Midway and Lower Geyser basins, Biscuit Basin and Obsidian Cliffs. We’ll depart daily at around 7:30am and stay out until 6:00-6:30pm for optimum light. Each guest will have two seats on the snow coach for camera gear and comfort during traveling. All photography will be done outside the snow coach from the road or on designated walking trails. Custom box lunches, snacks, and hot beverages are included daily while touring. Evenings are free to explore the town of West Yellowstone. Visit the Yellowstone IMAX theater or take advantage of time to review your portfolio with Dan. We prefer to give you the option to enjoy time to explore the town on your own, organize photos from your daily shoot, or simply rest. The days are long in the field with a lot of fresh air; it’s good to have some personal downtime and enjoy your trip—this is your vacation! Daniel will have one evening class (optional) to discuss image workflow along with a Q&A session. Our last evening will include a casual farewell gathering over beverages, appetizers, and pizza. Daniel will present some of his recent work. The evening is open to you to showcase your own favorite images to the group from the trip. Return to Bozeman early morning by shuttle and arrive at/before 11:00am. Please schedule your return flight no earlier than noon. Transportation is provided by authorized concessionaires of Yellowstone National Park. There are no refunds for travel delay issues or weather-related problems. We have the right to change snow coaches to accommodate groups depending on unforeseen circumstances or size of group. National parks have the right to change our itinerary. We can help book pre/post trip accommodations in Bozeman if needed. Please email us for details. If you’re interested in a private photography tour for your family, friends, or camera club, please contact us for available dates and rates. One of the advantages of joining our Winter in Yellowstone Photography Tour is that you’ll be traveling with like-minded people. It’s no fun going on a tour with people who don’t have the patience to spend time with the wildlife or wait for the sun to peek out from behind the clouds. Each day, we head out on the snow coach in the early morning to catch the nice morning light and stay out later in the evening for the same purpose. Transfers are provided from Bozeman to West Yellowstone. Many competitors want you to find your own transportation to West Yellowstone, usually by local shuttle bus. Since our transfers are private, if the opportunity arises, we can stop along the 90-mile road to photograph wildlife—sometimes bighorn sheep are seen along the way. The drive to West Yellowstone is a beautiful drive through a mountain canyon and also goes through a section of the park itself. While in Yellowstone, the group will travel two days in a private 25-seater snow coach. The snow coach is roomy and very comfortable and allows you to easily speak with Dan and the guide while traveling from location to location. The other two days the group will be on two 13-seater snow coaches; this is the only way we can travel to certain areas of the park in the winter. Each guest still has their own two seats for comfort and gear on the smaller coaches. Custom lunches are provided daily along with plenty of goodies in between 🙂 You may have considered a snowmobile tour, which can be fun for the first day, but 3–4 days is tough! Not only are you exhausted by the end of the day from riding and the elements of the park, but you can’t talk while traveling, so it’s more difficult to stop the entire group if you see something of interest. If it is a cold -20F morning, you could be in for a long day. Your lunch gets frozen, and so does your nose! Snow coach is the way to go—be comfortable and enjoy yourself! To make the most of your adventure with Tanya and me in Yellowstone, I thought it would be helpful to make a list of things you’ll want to consider bringing. I’ve lived next to this inspirational park for over 20 years and have been visiting an additional seven. I’m fortunate to be able to say that it’s truly part of my backyard, and I’ve learned a few things I’d like to share. 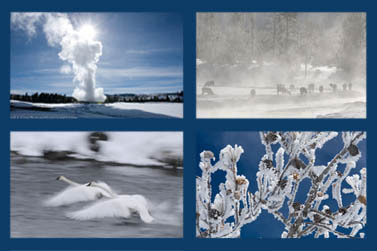 First and foremost, winter in Yellowstone is one of the coldest places in the United States. A more cold place, International Falls, Minnesota, is just north of where I grew up. I know COLD, and it doesn’t have to be uncomfortable. With the right gear, the intense beauty of Yellowstone’s winter is a sight to behold, and these recommendations will help you to enjoy it to the fullest. Let’s talk about cold weather gear first, and then I’ll make some suggestions about camera equipment you might think about bringing. When I’m dressing for the cold, it’s my opinion that the most important piece of gear you can buy is a pair of good boots. Don’t believe the incredible negative temperature ratings all boot companies advertise. What you want to look for is how thick the sole of the boot is. Ideally it should be at least an inch thick and more is better. The reason this is so important is simple; the further the bottom of your foot is away from the snow/ice, the warmer your foot will be. A pair with removable liners helps too, so you can take the liners out at night to dry them. Two great options come from Cabela’s and a local Montana company called Schnee’s. The Cabela’s boot is a recent discovery and it seems to be a good compromise between a very thick sole and moderate bulk. I found this boot by way of the polar bear scientists I’ve been working with on the Beaufort Sea in northern Alaska. The name of this boot is the Saskatchewan Pac Boot. They produce a similar boot to the Saskatchewan called the Trans-Alaska lll as well. Both can be found at Cabela’s. Another option is a boot by Schnee’s here in Bozeman. It’s called the 10-inch Extreme. They aren’t quite as warm as the Cabela’s boots, but the winters aren’t as cold as they once were, so it’s plenty warm enough for what we’ll be doing. Next in importance is your outer clothing. The most effective way to fight the cold is with goose down and synthetic garments. The good ones are expensive but well worth it if you plan to stay warm. Layering outerwear is imperative. I start with a synthetic type t-shirt close to my body. Patagonia has a nice selection of these types of shirts. I often cover the t-shirt with a cotton chamois shirt made by LL Bean or Cabela’s—warm and comfortable. The next layer is a pile jacket. Many good companies make pile jackets. If it’s really cold, my next layer is often referred to as a ‘down sweater.’ The North Face makes the Nuptse. MontBell, Mountain Hardware, Marmot, and others also make nice ones. These are not typically outer shells but more of a lightweight sweater type of garment filled with premium quality goose down. On top of this either a Gore-Tex (or equivalent) shell with a hood or a heavy down parka. It all depends on how cold it is. The beauty of layering is that you can mix and match, put on and peel off. The morning starts out really cool and by noon the snow may be melting. You can change accordingly at a moment’s notice. Next in line are pants. Typically in Yellowstone I’m most comfortable with a nice thick pair of pile pull-ons covered by a good pair of outer-rain/Gore-Tex (or equivalent) pants. Some of the outer ones come with suspenders which can be a bonus for some people. Ideally I like my outer pants to have zippers that go all the way up the sides. It’s easier to get them on and off while wearing large boots. Finally, hand and headwear. I use two different types of gloves when shooting in cold conditions. When it’s really cold, I often use the thickest gloves you can buy. Gates makes some nice options, but there are many off-brands as well. If the temperatures aren’t extreme, my favorite gloves are Scott’s, and they’re actually made for cross-country skiers. I like them because they have moderate insulation—typically Thinsulate—and they have supple leather palms which makes it easier to manipulate camera controls. The downside is that they often are not warm enough when it gets really cold, so that’s why I bring a thicker pair as well. I don’t use fingerless gloves as I see so many people doing when shooting pictures. I’m amazed at how this idea has taken hold. The reasoning many people give for fingerless gloves is so they can “feel the controls of the camera.” Unfortunately one can’t feel anything anyway after your fingers have been exposed for more than five minutes while holding a metal camera. Admittedly, using a heavy or moderately thick glove has its problems with accessing camera buttons, but you can get used to it. You’ll probably make some mistakes and even miss some pictures, but good gloves are at least as fast as fumbling with frozen, numb fingers, and you have the advantage of not being frostbit or worse yet, freezing your flesh. Bring a good pair of gloves for comfort. No picture is worth losing your fingertips! A warm hat is a must. Ideally a hat with some sort of wind guard or windproof material is best. I like the type that has the flaps that come down around your chin. Again, Cabela’s is a good supplier as well as LL Bean. You might also want to bring a balaclava or face mask. The wind can be harsh this time of year and a cover-up for your face is a nice bonus. Next on the list is camera equipment. The most problematic in cold weather is dead batteries. If your camera uses a lot of battery power in warm weather plan for double. Typically in really cold conditions I have a spare battery that I keep in my pile pants pocket, the one closest to my body. My body heat keeps it warm and when the battery in the camera starts to die, I just swap it out for the one in my pocket. When the new one in the camera gets cold and starts to go dry I just reach for the pocketed one and by this time my body heat has warmed it back to life. If you’re using AA batteries make sure you bring plenty, and ideally I would suggest spending the extra money on eneloop rechargeable batteries. I’ll be carrying my camera gear in a Lowepro roller case that fits nicely beside me in the snow coach. For travel off the snow coach into the geyser basins I typically take one body with one or two lenses that I’ll carry in my pockets or possibly a photo vest. Included with camera gear will be paper lens cleaning tissues as well as a microfiber cloth for cleaning lenses. Snow and steam from the geysers make cleaning lenses mandatory. I’ll also be carrying a small paintbrush I use for cleaning snow off my lenses and camera bodies. Falling snow can create some of the most beautiful images you can take in the winter, especially if you have animals in the scene. If the temperatures are really cold, the snow easily brushes off with a paintbrush. If it’s wet snow then I’ll be using a rain cover. I can’t make any good recommendations for rain covers since mine are homemade. They are nothing more than a Gore-Tex cover constructed from the leg of worn out rain pants. I cut the leg off, slit a seam down the middle and sewed Velcro on each side of the seam. It works great! Finally a tripod is a must for longer lenses and landscape opportunities. I use a Gitzo carbon fiber with a Kirk ball head. This combination is light, fast, portable, and relatively compact. I do not recommend the full-sized Wimberley head. It will be too bulky with the camera gear we’ll be putting in the van. I hope this helps to answer any questions you may have regarding travel and shooting in winter conditions. If not, feel free to drop me an email and I’ll do my best to answer you in a timely manner. "The Yellowstone trip was exceptional. Your careful attention to detail was a big reason. Thank you for the wine and all the other "in room" surprises and treats. Thank you for dinner and pizza. Thank you for the custom lunches and in between meal snacks. Thank you for the huge job of getting luggage from West Yellowstone lobby to the Hilton room!! Thanks for the patience and the smiling faces." "First, I want to repeat again how special the Yellowstone trip was. It was a picture perfect trip (pun intended) and in my mind will be a trip of a lifetime. A big thanks to you and Dan for putting on such a wonderful experience. Yellowstone in winter was unexpectedly the most beautiful place I have ever witnessed. To steal a line from Sue, you, Dan, Art and Sue really feel like family now. The four of you couldn’t be nicer to be with and travel with." "It was so nice talking with you this morning. I did not say, what I have been meaning to write, thank you so very much for such a wonderful introduction to Yellowstone National Park. You certainly made the trip an unforgettable experience. Dan's love of the park and photography and your attention to detail are an unbeatable combination. We will follow you anywhere." "Natural Exposures Yellowstone Trip in winter is absolutely wonderful. I have been 3 times, every time as special as the next. Well organized, each guest is given special care and Dan makes sure everyone is capturing great images. Thanks Dan & Tanya! I would just about go anywhere with you!!!" You and Tanya run a top of the class event. Your willingness to be there to help us become better photographers and Tanya's attention to detail makes the experience enjoyable and effective. Thanks for the opportunities Natural Exposures provides us to travel to "bucket-list" destinations and to become better photographers. "Pretty perfect from start to finish. I've fallen in love with Dan, Tanya, Colter and of course, Yellowstone. Thank you for a wonderful experience!" "Best travel and photo experience. EVER!" "Great trip. Great organization. Lunches exceptional." "OK - If you love getting close to wildlife - this is the tour for you!" "Absolutely amazing and beyond my expectation in every way possible! Seriously -"
"Terrific. Things that impressed me - detailed clothing list, Dan calling two months ahead to check in, efficiency to be personal, and enjoyed how the group coalesced." "The Yellowstone Winter Tour was outstanding. We saw so much beautiful landscapes and winter wildlife. I would recommend this trip to everyone. Was very impressed by the efficient presentation of all the tour details." "Our "Winter in Yellowstone" trip was just terrific, great weather, great traveling companions, great attention to everyone's wishes and expectations. Dan's patience gave us an amazing wildlife experience."